The Kenmore Iron w/LCD Temp Control comes packed with a lot of features. First off, there's an LCD monitor above the handle with two buttons that let you scroll through the list of heat settings (cotton, silk, wool, etc.). There's also a dial at the very top that goes between no steam, light steam, and full steam. The steam feature only works on the higher heat settings to keep you from ruining your favorite silk top! Every now and then, you need a little extra help to get rid of stubborn wrinkles. Thankfully, the Kenmore has two buttons, one that adds a burst of steam and one that sprays a mist of water to help loosen wrinkles. The water tank is pretty big...I use the iron on a daily basis for my husband's pants and shirts and only fill it about once a week, as opposed to my old iron which had to be refilled constantly. My only complaint here is that the water tank can be hard to see through...you can't always see clearly where the water line is. Not a huge deal, but something I noticed. The iron comes with a handy self-cleaning feature that gets rid of all the mineral deposits and buildup that happen in irons. Simply fill the water tank, hold the self-cleaning button, and allow the water to drip out of the bottom of the iron and into the sink. The whole process takes less than 5 minutes every month or so and protects your clothes from being stained with the disgusting buildup that can occur with dirty irons. One thing I wish the Kenmore had is a retractable cord. My old iron had one as do most irons nowadays. It's nice to be able to push a button and have the cord wrap itself up inside the iron. While they didn't provide a retractable cord, they did leave ample space for you to wrap the 10 foot cord around the base of the iron...not all irons have cord storage space so you're forced to wrap it around the baseplate. Oh, and yes, i said 10 foot cord. You can iron practically anywhere with a cord that long! Of course the long cord could be the reason why the cord's not retractable...not enough room to store something that long. Another downfall for me was the upright steam feature for use on drapes and hanging clothes. I tried using the feature on a shirt that had light wrinkles but found it a little awkward to manage. Of course this is just an extra feature of the iron, not it's main function. If upright ironing is something you plan on doing quite often, you'd be better off buying an actual steamer. I forget to unplug my iron all the time. I always think I'm going to come back and use it or put it away but I end up running late and heading off to work forgetting that the iron is still on. Sure enough, Kenmore thought about people like me and included an auto-shutoff feature. If the iron is on for more than 8 minutes without use, it shuts off. If you leave it in the down position for more than 30 seconds without movement, it shuts off. It's the perfect thing for me...I don't have to worry about my house burning down while I'm at work! The last feature is the storage strip which runs along the baseplate. When the iron's hot, the strip is red, indicating it's not ready for storage. Once the iron cools down, the strip changes to black, meaning it's okay to put away. Now you can check the strip before putting the iron away to make sure it doesn't burn anything in your storage closet. I'd recommend the Kenmore Iron w/LCD Temp Control to anyone in the market for a new iron. at $39.99 it's a great feature-packed iron that will last you quiet awhile. 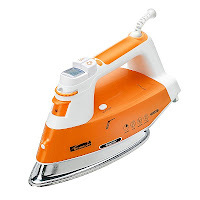 I have this iron..it's the best one I've ever used! I've left to work without turning it off many times without having to worry about my house or my stuff catching on fire. I love it too! I've dropped it a gazillion times and ended up knocking something loose but it still works perfectly after all these years! Definitely a great buy.